I was two days away from my thirty-second birthday and giving birth to my first child. “Push, push! Come on, you can do better than that,” the nurse was yelling at me. “No, I can’t. I’m giving it everything I’ve got,” I remember saying. “There’s something to be said for having your kids when you’re younger,” she grumbled. Everything after that is a blur. My baby boy came out healthy and demanding my attention from his first breath. He weighed nine pounds but the statistic that impressed me was that his head circumference was thirty-seven centimetres. “The nurse didn’t think so,” I said and then recounted my “moment” in the delivery room. I was still angry weeks later and now so was my doctor. “Some people still believe that the best time to give birth is in your early twenties. It’s old thinking,” she said. “Who’s ready for that in their twenties?” I’d had a long labour and a tough delivery. Since then, a number of my friends have had their first children at forty-two and forty-three. I didn’t think that unusual. My mother gave birth to me when she was forty. And back then, that was definitely rare. I was the youngest of three; my sisters were ten and fifteen when I was born. “Why the big gaps?” I asked my mother. “Was it because dad wanted a boy?” I asked what I had wondered for so many years. “If on average women live seven years longer than men and he’s twelve years older than I am, I’m going to be alone for nineteen years. I don’t know if I want that,” I said. “Yes, but remember, those are statistics. You can’t plan your life out too carefully. Sometimes you just have to live it.” My mother adored Eric. We had been married for ten years when both of my parents moved in with us. My mother had been diagnosed with Alzheimer’s and needed care. My sisters were working full time but I had taken time off the paid workforce to raise my two children. I was at home anyway, so why wouldn’t I look after my parents too? Looking after my parents was not only what I wanted to do, it was what I had been raised to do. In our Portuguese culture, it’s normal, it’s expected, it’s just the way it is. Our situation was more complicated than most in that my parents didn’t speak English very well. They had immigrated at the age of fifty and their knowledge of English at the time was limited to a few words and sentences. Both of them had started their Canadian life working hard, each of them often juggling two or three labour-intensive jobs. Learning English dropped on the priority list—they had to house and feed their family. After nearly three decades, they could get by in their adopted country, but their English was still broken. I remember crying in the shower one day, thinking, Oh my God, I am going to be looking after needy people for the rest of my life. “Yes, you’re right. I mean, I could step off the curb one day and get hit by a truck. That would be horrible.” I remember laughing so hard after I said that. I was exhausted. My mother died after living with us for two years. My father died nine months later. And then, two short years after that, when we were finally recovering from all the grief and were establishing a new normal in our extended family, my sister Maria was diagnosed with aggressive, terminal cancer, and died. She was fifty-six. That baby I pushed out all those years ago has now finished university; his sister is halfway through. Both are adults with their own dreams. Eric will retire at the end of the year and soon after that I hope to get my degree. No part of our lives follows the expected trajectory. We seem to live life by the seat of our pants and, most of the time, I wouldn’t want it any other way. Esmeralda Cabral is a graduate of The Writer’s Studio at Simon Fraser University and a current MFA student at the University of King’s College in Halifax. Her work has been published in anthologies, the Globe and Mail, and online. Two of her stories have aired on CBC Radio. She lives in Vancouver with her family and her dog. Laura Kenney was born in Moose Jaw, Saskatchewan, but her roots are in Nova Scotia and she has resided in the province for the past 20 years. 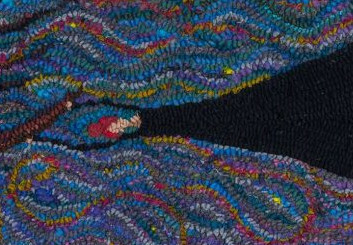 Laura began rug hooking when she moved to Truro, NS, in 1998. Her work has been represented by the Nova Scotia Folk Art Festival since 2009. It was at the festival, after talking with the artists and seeing the art, that she realized her humourous, colourful rugs were indeed folk art. Laura received juried status with the Nova Scotia Craft Council in 2010. Her work “Morning Routine” and “Waiting for the Cat to Let her Out” was purchased by the Nova Scotia Art Bank for their permanent collection in 2010 and 2016. 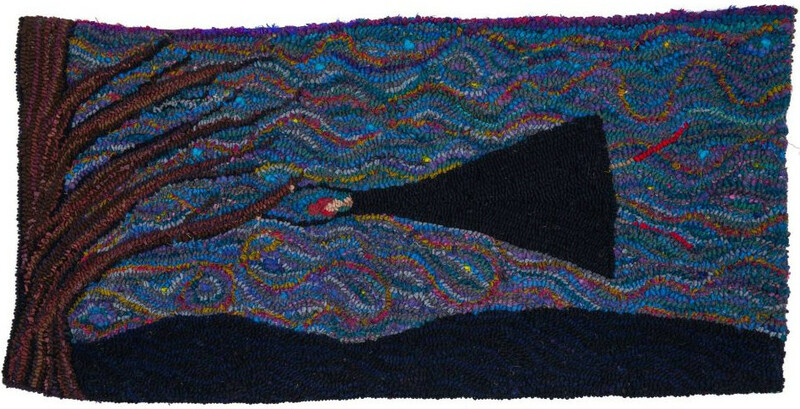 Kenney was featured in Rug Hooking Magazine in 2013 (“The Stories of Laura Kenney”) and in the book Simply Modern in 2014. In 2016, Kenney had her first solo show at Mary E. Black Gallery in Halifax and a selection of Kenney’s work was included in Terroir, a group show at the Art Gallery of Nova Scotia in 2016-2017. Laura works from her studio in her small green house where she lives with her husband and two children, Jonah and Zoe. Hang in there…take care of yourself. Laura, thanks for your comment. And yes, building a community of care…now there’s an idea! Great insight to a caregivers lament and the need for respite Esmeralda. We have had eight years of that with our daughter Kimberly and I went through some horribly difficult times through that period. Kimberly went into rehab just this past week, which again is traumatic for any parent, but she won’t be there forever, just long enough to gain life skills towards a measure of independence. There was and is a lot of light peering through those dark spaces and at this point I feel honoured to have been with Kimberly throughout, unconditional love has no measure and she has been and still is one of my greatest teachers. Someone once said “Your last refuge is your attitude” and I couldn’t agree more. It’s all about family and I admire what you and Eric have done for your parents. It just is. James, thank you for sharing your experience here too. I had an idea of what you and J go through, but of course, not really. All the best for Kimberly’s rehab, and love and peace to you and J. Beautifully written! ❤️ it so much! The concept for the rug is great! You are both very talented! Thank you, Maria. I also love the rug. I look at it and admire it a lot. A beautiful article, Esmeralda. The new normal is a concept most all caregivers describe to me…often experiencing it several times over.